We can carry it, she said. It’s not that heavy, she said. It’s only 1.3km, she said … OK, she didn’t say the last bit, I Googled it afterwards. My sister’s boyfriend offered to drive theirs over in a ute this weekend, but his hand got smashed with baseball bat. When I tell people, they immediately presume there was gang violence involved, but he’s a catcher in a baseball team and someone took a dodgy swing. His hand was pinned back together via elaborate surgery earlier this week. Two days later, I stupidly asked him to babysit the mad moodle for a few hours while the cleaners came over. What’s the first thing the mad moodle does? Launches onto the pinned hand. I cried for two hours afterwards. It’s been an emotional week. My sister suggested we walk the glass-topped table to my place instead. Jaysus it was freaking heavy. We had to stop three times each block and do elaborate stretching exercises. We were also on a strict timetable – 30 minutes tops – as my sister needed to drive her boyfriend to his baseball match so he could score. That’s dedication for you. He nodded and smiled and kept walking. But the outdoor setting looks mighty fine on the deck. Thanks sis. Well, all the muscles in my arms don’t thank you, but I do. « HouseGoesHollywood: Guess who’s a pitbull in bed? 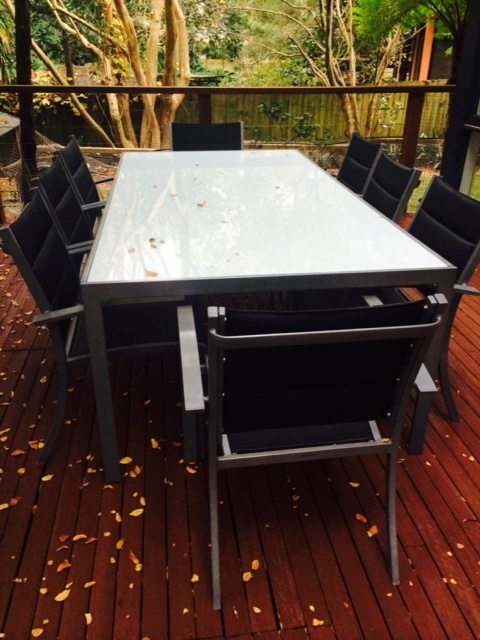 So now we own the same outdoor setting and yes it is heavy. Girl power or what. I was wondering that myself Geoff S. It looks nice on the deck nevertheless and think how good it was for your biceps and triceps! the stairs if it is in a cardboard box!